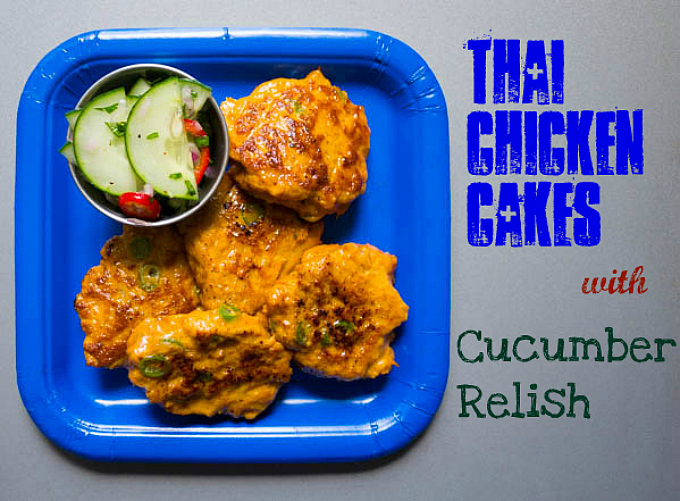 You already know about my love for Thai food (here) and my love of cakes/patties (here), and today we are combining the two! 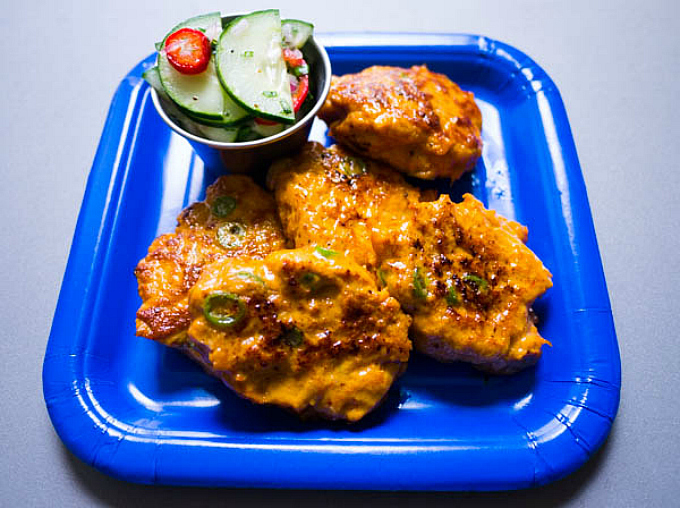 These are really light, flavorful chicken patties with a very “springy” texture. Even though they are pan fried, they have the texture of a good sausage – a nice pop as your teeth pierce the outer layer and lots of tender and moist meat inside. 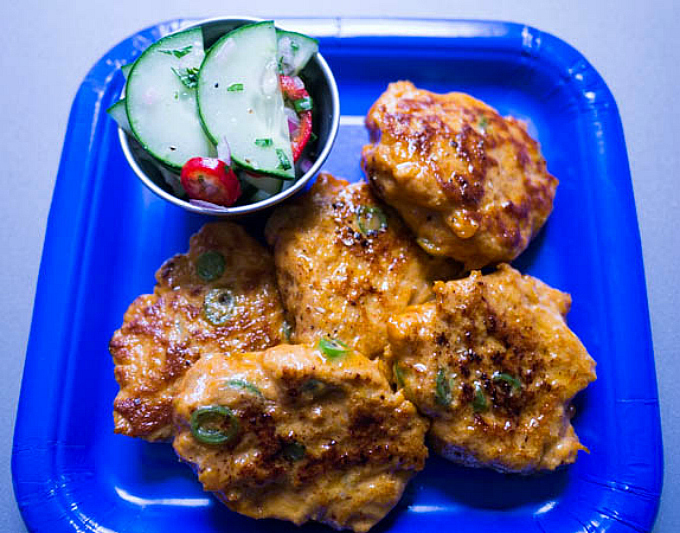 They are slightly adapted from Thai Fresh’s Tod Man Kai Fried Chicken Cakes to really bring up the heat and make them spicier. The fresh green beans add a great crunch. You’ll want to serve them with the cool cucumber relish as a nice contrast to the fiery curry heat. 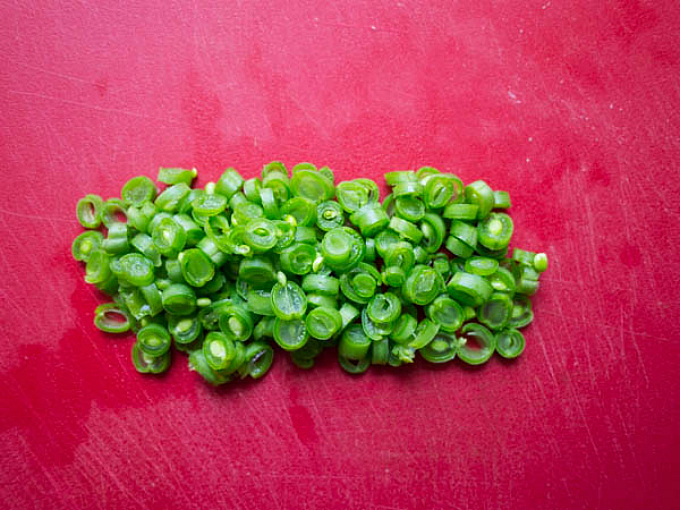 Start by making your cucumber relish, because it needs to sit for a while. 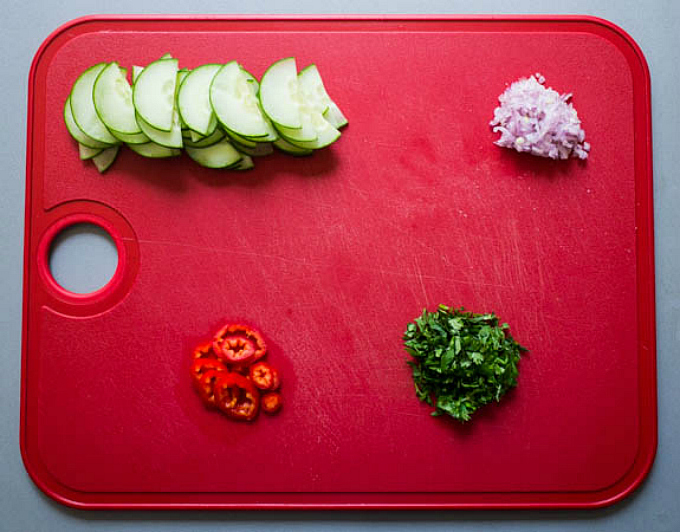 Chop your cucumber, chili pepper, shallot and cilantro. In a small bowl, combine white vinegar and sugar and stir until sugar is mostly dissolved. Add cucumber mixture and stir to combine. 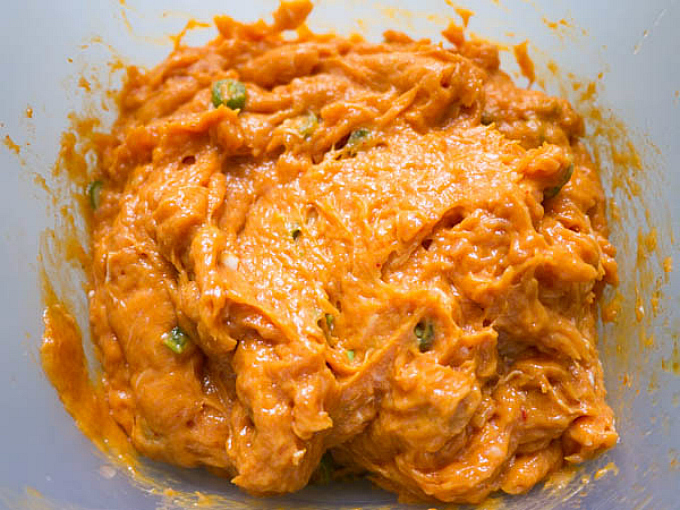 Leave cucumber relish to marinate for 20 minutes. Now, onto the chicken cakes. Finely chop 4 fresh green beans and set aside. 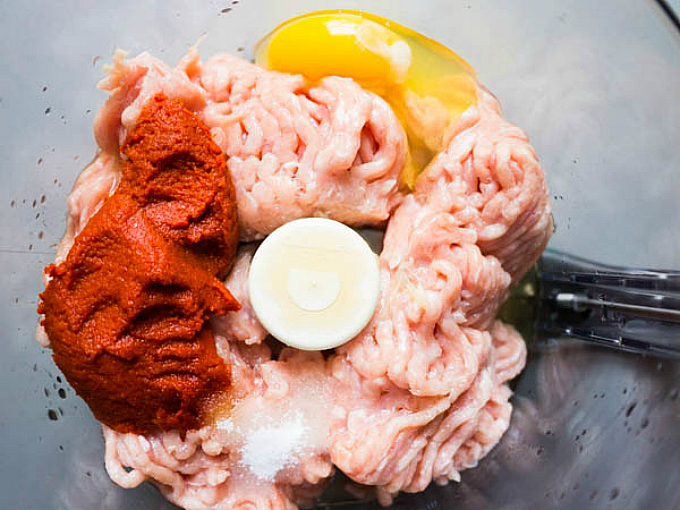 Combine ground chicken, curry paste, eggs, fish sauce, lime juice, and sugar in a food processor. Remove mixture to a large bowl and mix in the chopped green beans. If you put the green beans in with the other items in the food processor, they get too small and you lose the crunch. Spray a non-stick skillet with a little oil and heat on medium heat. 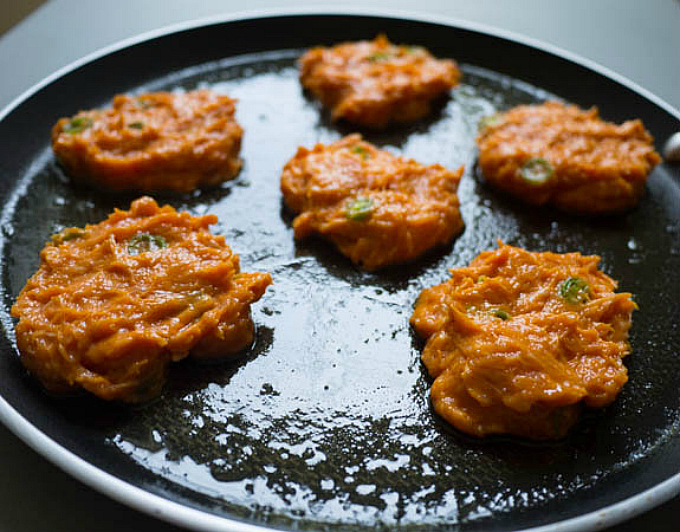 Form the chicken mixture into little patties about 1/4 cup in size and fry in small batches. Cook on each side until golden brown and cooked through, approximately 5 minutes per side. You should be able to get about 18 patties. 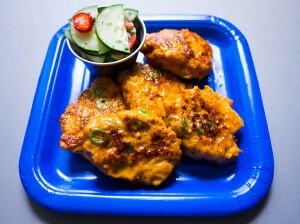 Juicy and tender fried chicken cakes with thai seasoning and fresh green bean bite. Served with refreshingly cool and spicy cucumber relish. Start by making your cucumber relish because it needs to sit for a while. 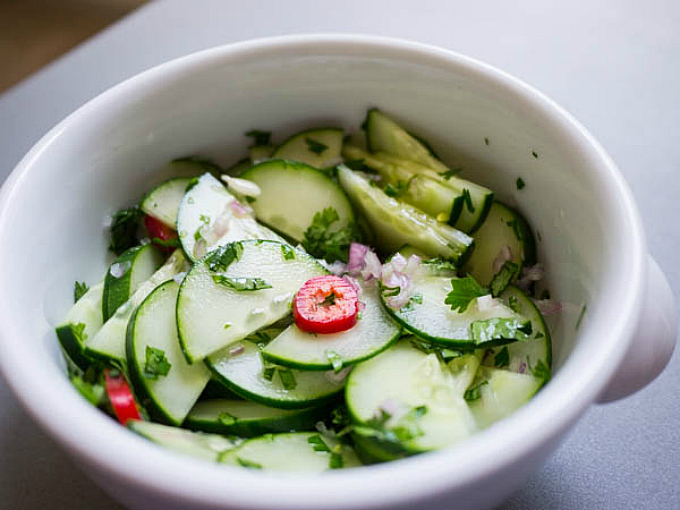 Chop your cucumber, chili pepper, shallot and cilantro. In a small bowl, combine white vinegar and sugar and stir until sugar is mostly dissolved. Add cucumber mixture and stir to combine. Remove mixture to a large bowl and mix in the chopped green beans. Spray a non-stick skillet with a little oil and heat on medium heat. 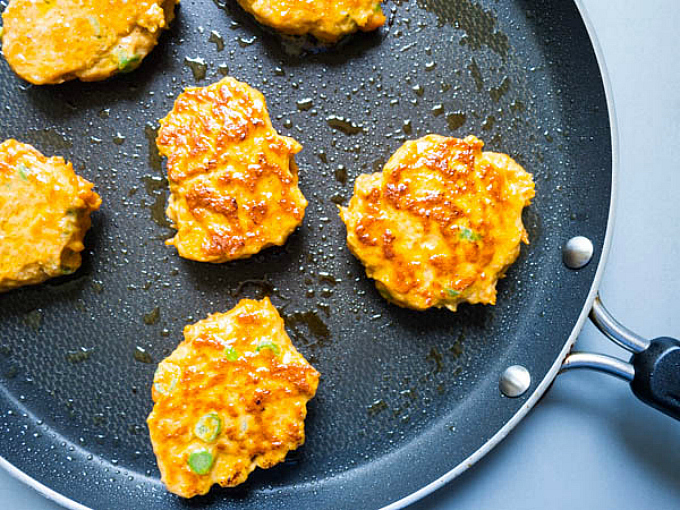 Form the chicken mixture into little patties about ¼ cup in size and fry in small batches. Cook on each side until golden brown and cooked through, approximately 5 minutes per side. You should be able to get about 18 patties. Serve with cucumber relish and enjoy! Nutrition above is for the chicken cakes alone. Nutrition information for the entire batch of cucumber relish is as follows: Calories 88, Carbohydrates 22, Fat 0, Protein 1, Sodium 7, and Sugar 18. Divide relish into as many servings as necessary to calculate nutrition information per serving. I never think of cool things … like putting chopped green beans in a chicken cake. This looks marvelous. Me to my boyfriend: How do you feel about thai chicken cakes? Him: that sounds weird. What is it? Him: oooooo, that sounds effing awesome. Sounds like we’re making these this week! Sound so good. Red curry paste is my favorite!!! Is the carbs per cake or for the whole bunch of cakes? They were so delish!!! Bf says “tell her they were effing awesome!” (apparently this is our phrase for things related to curry..) We added a little sriracha to half the batch too which was a nice pop. Thanks for the tasty dish! 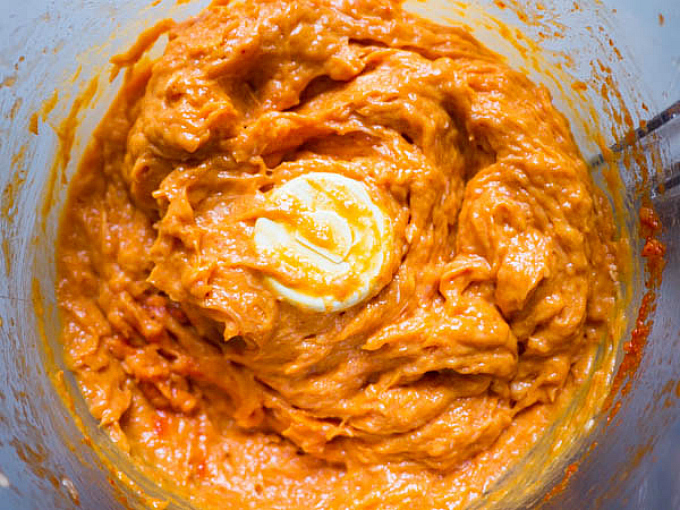 Do you add it with all the ingredients in the food processor just curious that’s what I will do. sounds like a great recipe sort of a Chick Tod mun . There are many ways of making chicken cakes this is by far the tastiest. I love them.